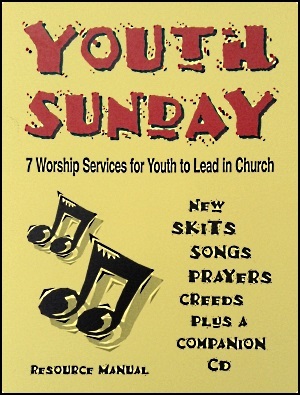 The Youth Sunday resource book contains 7 worship settings designed for youth to lead in church or for special events. Each setting contains 2 skits, 4-5 songs, faith statements, confessions, a sample bulletin, and lead sheets. A songbook with full piano scores is also available. Worship Settings: Called to Grace, Shine for Christ, We’re a Family, Reach Out, Surrounded by Prayer, Blessed are the Peacemakers, and River of Mercy. Sample Service: View the “Called to Grace” worship setting. It’s our “best of” CD of Cross the Sky songs for youth-led worship. They have been taught at churches, camps and youth events across the country. The CD is an ideal tool for teaching the songs in the Youth Sunday resource book. Danny The Kid – Go ahead! Make my day! It’s an old fashioned shootout in this western melodrama. The Big Red Box – It’s big! It’s red! And it’s free! What’s inside that big red box anyway? Look and see! What Can I Do For You? – Take a risk and radically love those around you! You just might save their life. Frozen People – A call to reach out with God’s love to those around us! Shatter those frozen people! Choose an individual item or complete package from the menu below and select “Add to Cart”. $2.00 shipping will be added per line item for online orders. We ship orders via priority mail.